It was a day when the expression of love for Australia, came naturally. On 26 January, a group of culturally and linguistically-diverse women and girls came together to celebrate Australia Day. 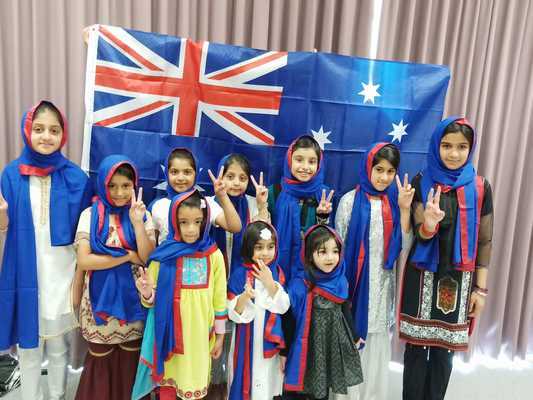 The event, attended by 36 women and 20 girls of the Ahmadiyya Muslim Association, Berwick chapter, began with young girls singing the national anthem of Australia, praising the nation they now call home. Although many of the young girls who came to celebrate are born in Australia, their parents are migrants from different parts of the world, predominantly from South Asian countries. A young girl presented a speech on the topic of ‘Loyalty to one’s nation is part of our faith’, recounting the countless freedoms and opportunities that are accessible to all Australians. “We take pride in calling ourselves as Australians – that is part of our identity”, said a young migrant who has recently become a naturalised Australian. She said that the day she became and Australian citizen was a very special and emotional day for her. A mother of four expressed her vision for Australia’s future where people from all parts of the world can live in peace and in harmony to make this country ‘renowned of all the lands’. Every year, on Australia Day, the Ahmadiyya Muslim Association holds a community event at the place of congregation, where people from all walks of life share a laugh or two, followed by a dinner in the spirit of the day.